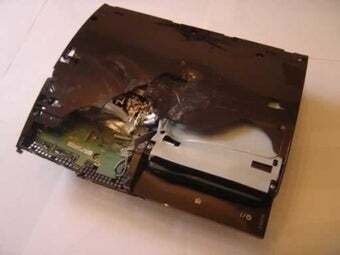 Me no speakum hackese, but it sounds like the guy who gave us the iPhone jailbreak claims to have finally hacked the PlayStation 3. Without specifying how (and explaining it to me would be like reading Siddhartha to a dog, in Klingon), George Hotz says he pulled it off after five weeks of work with "very simple hardware cleverly applied, and some not so simple software." I have read/write access to the entire system memory, and HV level access to the processor. In other words, I have hacked the PS3. The rest is just software. And reversing. I have a lot of reversing ahead of me, as I now have dumps of LV0 and LV1. I've also dumped the NAND without removing it or a modchip. Hotz says he's not revealing his exploit yet. While it "isn't really patchable ... they can make implementations much harder." Wonder if this portends a fast firmware update to snap it shut. That is, if it really has been hacked. But Hotz's cred in this realm is pretty solid. Interesting.